Jeff Minter is something of a British coding legend and is best known for his spins on classic arcade titles. 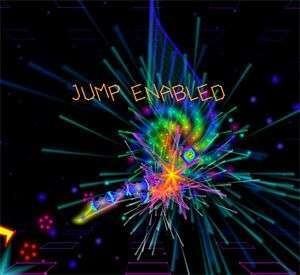 Xbox 360 gamers may remember Space Giraffe, a bright neon take on Tempest whereas his recent iOS efforts have taken on such classics as Asteroids and Robotron infused with his signature neo-retro visuals. Although Minter’s work often focuses on established gameplay, he deserves much of the credit for the neo-retro movement given that it was Tempest 2000, his official Tempest sequel that was one of the few shining lights on the Atari Jaguar, that helped establish the genre. Tempest 2000 took the gameplay of Tempest – you run around the top edge of various flat and looped level structures while shooting into the screen and the various beasties that are moving towards you and will kill you when they get to the top – and stabbed it through the chest with a syringe full of adrenaline. While Tempest isn’t even that great a coin-op title (sorry), 2000 gave it some sizzling graphics and a bombastic soundtrack that took the game to a new level. 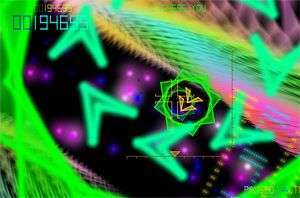 TxK takes that same formula and crams it into the PlayStation Vita while adding a few extra nuances to the gameplay but without straying too far from what made Tempest 2000 so good. Where Space Giraffe was adamant that it wasn’t just Tempest in a fancy frock, TxK makes fewer protestations. Indeed the title may well be a nod to it if you consider that Jeff refers to Tempest 2000 as T2K. So straight from the off you can expect to be rim-running and blasting enemies. TxK‘s twist on that is the addition of powerups that add to your offensive abilities as well as giving you a crucial jump ability. When active, tapping the right shoulder button lets you leap above the rim and blast away at any enemies that have made it that far. Also, subtle use of the analog stick with allow you to take out enemies that have made it that far up the screen, a case of affairs that would equal death in previous games in the series. You are also given one smartbomb per level. This can be used to save you when grabbed by an enemy or can be fired off in normal play for addition points. Minter has always been big on risk vs reward gameplay and this reflects that, although it’d be more exciting if both the risk and reward were a little bit more meaningful. As you progress through each level, your lives and score are recorded allowing you to restart from that stage in the game’s Classic mode. This feature, which was present in Space Giraffe, is great as it allows you to play through all the game’s stages, albeit with much effort and skill required. The alternative is to play Pure mode which sees you starting from level one each time. This is where the leaderboard fun is to be found though and is where most players will be spending their time. It’d be nice if the game showed your next leaderboard target on the screen but, like Surge Deluxe, it doesn’t and that’s a slight missed opportunity. Survival, the last of the game’s three modes, has you starting from the beginning once again but takes away the ability to earn extra lives or access bonus levels. The gameplay, derivative though it may be, is genuinely exciting and the game is a worthy successor to Tempest 2000. TxK puts you in a zone where you make split-second decisions and somehow find yourself surviving while the powerups give you much-needed respite from the sometimes overwhelming challenge each level provides. This is aided by the tight controls that make it a joy to play on the Vita, the only concession to modern control systems being that you have to tap the screen to fire off your smart bomb. Having struggled with Minter’s recent efforts on iOS, it’s a real joy to get a game like this on the Vita and that’s before you get onto the game’s stunning presentation. The only downside to the controls are the bonus ring stages which are tough to figure out and you don’t really get a chance to orientate yourself to what’s going on before you fail them. TxK, like the original Tempest, uses vector graphics. That means everything is presented in wireframe shapes and while this can be quite limiting for some games, it works here. Of course, Jeff has turned the brightness and colour up to eleven and when viewed on the Vita’s lovely OLED screen the effect is spectacular. Add to this a fantastic techno soundtrack and you’re bound to produce a few extra endorphines when you start playing. Veterans of Space Giraffe will well be aware that Minter doesn’t really care if you can see everything though but thankfully, for the most part, TxK dials down the retinal-fuckery enough to keep the game fair and playable. That said, certain complex level shapes – in particular stage 14, The Ear – can lead to confusion and rob you of plenty of lives. Also, while enemies are pretty clear to see, their bullets can sometimes sneak up on you a bit. That said, it was way worse in Space Giraffe and that was still fun. Modelled as it is on an old coin-op, TxK isn’t the deepest of gameplay experiences but that’s not necessarily a big deal when it comes to anything on the Vita, and I quite appreciate the quick and easy thrills that TxK provides. Top leaderboard positions, and the majority of the game’s trophies, will be beyond mere mortals but that shouldn’t put you off especially if you’re one of the Vita true believers who realises that the handheld is destined for greater things than just Call of Duty. 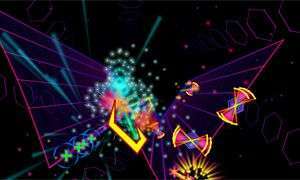 TxK may well be the best thing to come out of Llamasoft for years. All it wants to do is get you pumped up and it delivers that in spades. It's not the deepest gameplay experience out there but for people who want a quick hit of gaming adrenaline, there's probably not a better option out there on any console. Another great reason to own a Vita.